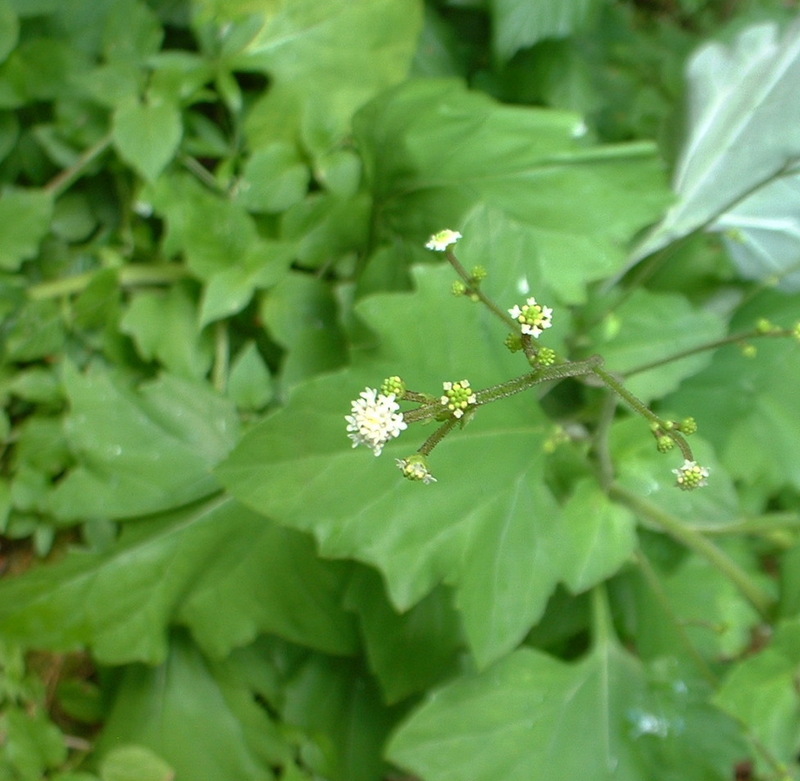 Pathfinder (Adenocaulon bicolor) – Brings the vibrational octaves of the ley lines (energy meridians) of the Earth, the organ energy meridians of the human subtle bodies, and the cosmic pathways of light and sound into resonant harmony, which improves your health and well-being. Spins the Earthstar chakra, the 3rd eye chakra and the star chakra. I AM vibrant health stemming from harmonious dimensional alignment. Pathfinder plant grows from southern Canada to Northern California at low to middle elevations in moist, dense shady forests and in open areas within woodlands. Pathfinder plants get most of their sunlight from temporary patches of light that move around the forest floor called “sunflecks.” Tiny daisy-like flowers grow atop slender stalks. Heart-shaped leaves grow close to the ground at the bottom of the stalk. Each leaf is bright green on the top and silvery on the bottom. As you walk along a forest trail, turn over the leaf to show the silvery bottom and it will show you the way back. Use Pathfinder Flower Essence when you feel disconnected, discombobulated, ungrounded, like your circuits are jumbled and/or you are having disruptions in higher dimensional awareness and communication. Supportive when dis-eases occur that, seemingly, have no cause. This essence was made at pathfinder plants that grow in the woods along a ley line at Tree Frog Farm. Human physical and subtle bodies are a microcosm of the galactic macrocosm. We are each a hologram of the whole. As the Earth, all of her children and the Galaxy are evolving, the interdimensional communication that connects these parts of the system into a whole may go temporarily out of sync while the frequencies of the various levels upgrade. Humans (and animals) now need additional assistance integrating our energy meridians with the energy lines of Earth and the galactic pathways of light and sound. Bringing these 3 octaves into alignment is vital for vibrant health while adjusting to evolutionary impulses. In addition, Pathfinder flower essence spins the Earthstar chakra (approximately 2 feet below your feet), the 3rd eye chakra and the star chakra (approximately 2 feet above your head). As Pathfinder Flower Essence brings all of these into harmonious balance, your moods, physical health, spiritual connection and your overall sense of well-being will improve. This essence was made with the “no-pick” method of bringing the frequency of the plant spirit directly into the mother/storage bottles as they are sitting with the plant. While the essence was being made, crystals of amber, andalusite, black onyx, drusy quartz, icosahedron cut quartz, inca jade, moldavite, stibnite and tektite were placed among the plants with the storage (mother) bottles. The sun acts as a transformer to step down spiritual energies from higher dimensions. While the essence was being made, Amber acted as a lens to receive and focus sunlight for this purpose. It also aligns the subtle bodies with the physical bodies, transmutes negative energy into positive energy, and emits a sunny and soothing energy that calms and enlivens the disposition. Andalusite stimulates the soul star and earth star chakras enabling your Higher Self to function more easily in the physical body, while protecting the nervous system from being overloaded. Assists knowing Earth is your home this lifetime and enjoying living here. Black onyx helps you to absorb energies that you need from the universe, grounding them with focused energy and appropriate use of power into a positive force. Drusy quartz crystals help to energize and stabilize your subtle bodies. Icosahedron cut quartz has 20 (5X4) equilateral sides. It is a bridge between the 5th Dimension - the entry into the unified Spiritual realms - and the 4 cardinal directions (N, S, E, W) on Earth. Inca jade encourages you to delight in life, this time of being Spirit in the world of matter. Moldavite was formed as part of meteorites that fell to Earth more than 15 million years ago. It serves the inhabitants of Earth by facilitating strong, clear, and direct interdimensional interconnectedness between your consciousness and the higher planes of Light. Stibnite helps you to assimilate high frequency energy into your body and complete your energy circuit with the Earth. Tektite aids in expanding your awareness beyond Earth into the stars. It helps your physical body easily integrate high-frequency energy. The actions of the crystals inform the way this essence seats into the physical body. While the Pathfinder Plant essence was being made, imprints of rattle, eagle feather and spirit song coming through Diana’s voice were infused into the essence.